Avengers Guardians Assemble! Marvel/Disney has started the new year by unveiling the lineup for its August 1 cosmic super hero flick "Guardians of the Galaxy." And it looks good. Granted, everything we've been hearing about the space adventures so far has been pretty great -- with one insider going so far as to say Chris Pratt aka Peter Quill will be an A-lister after it. This is the first official pic to be released of "Guardians" and it features a shot included in last summer's comic-con footage (and yes, you can see a low-res version of that footage, if you'd like). 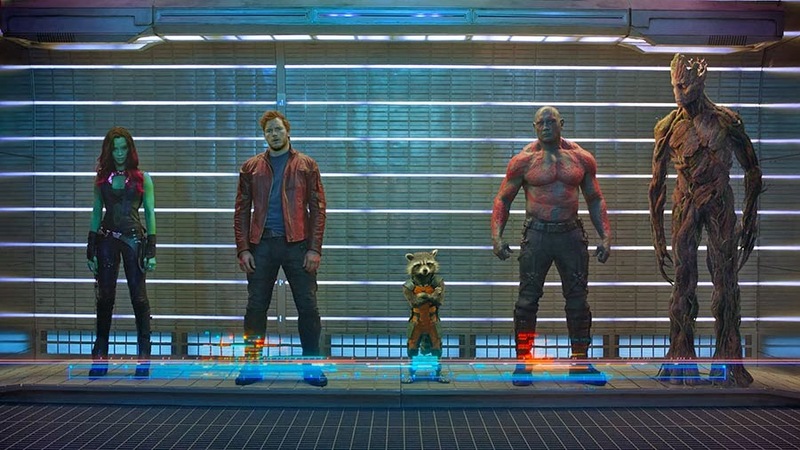 In the shot, from left, we see Zoe Saldana as Gamora, Pratt as Quill, Rocket Raccoon (voiced by Bradley Cooper), wrestler Dave Bautista as Drax the Destroyer and Vin Diesel as Groot. Not shown is Karen Gillan as Nebula, Michael Rooker as Yondu or Benicio Del Toro as The Collector (although we have seen him somewhere, if you'd like to peruse a spoiler). But we still have a long wait before the movie comes out, so there's plenty of time for those reveals. 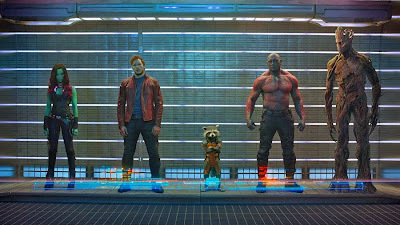 "An action-packed epic space adventure, Marvel’s 'Guardians Of The Galaxy' expands the Marvel Cinematic Universe into the cosmos, where brash adventurer Peter Quill finds himself the object of an unrelenting bounty hunt after stealing a mysterious orb coveted by Ronan, a powerful villain with ambitions that threaten the universe. To evade the ever-persistent Ronan, Quill is forced into an uneasy truce with a quartet of disparate misfits — Rocket, a gun-toting raccoon, Groot, a tree-like humanoid, the deadly and enigmatic Gamora and the revenge-driven Drax the Destroyer. But when Peter discovers the true power of the orb and the menace it poses to the cosmos, he must do his best to rally his ragtag rivals for a last, desperate stand — with the galaxy’s fate in the balance."